This Monday, more than 30,000 athletes will lace up in Hopkinton take part in one of the most prestigious marathons in the world. 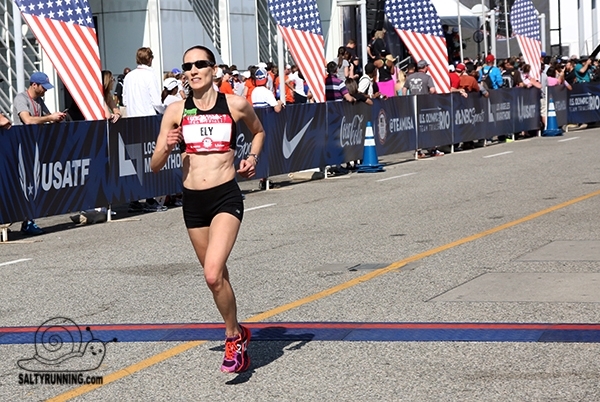 Ahead of the race, we asked sport and movement science faculty member Brett Ely about her extraordinary marathon success, her academic research, and what makes the Boston Marathon so special to the running community. What has your academic journey been like? How did you come to teach at Salem State? I went to James Madison University for my bachelor’s and master’s, studying nutrition and exercise physiology, and was also a student-athlete (track and cross country). My PhD in physiology at the University of Oregon focused on how heat stress can be beneficial for health and athletic performance. I’m originally from New England and wanted to return to the area after my PhD. I was attracted to the sport and movement science department at Salem State because of their strong academic programs and their support for research, and coming from the Boston area I had a lot of research connections already in place. In addition to your academic work, you’re also a very accomplished marathon runner. What are some of your running career highlights? I’ve qualified for the Olympic Trials four consecutive times (2004, 2008, 2012, 2016). My personal best is 2:38:53. I also represented the United States at the 2011 Pan-American Games in the marathon and have been lucky enough to win four marathons around the world. The marathon is such a universal experience. Everybody is starting on the same start line and running the same miles on the same course. No matter how well training goes, everyone is nervous about completing such a remarkable distance. Were you training seriously while you were pursuing your PhD? I qualified for my fourth Olympic Trials while I was completing my PhD. It was a lot, but it really came down to really good time management. It also helped that the team I was part of, Team Run Eugene, became both my training group and my social outlet. Does your personal interest in running help drive your academic research? My life as an athlete was really an experiment of one. Variables like nutrition, training and rest all play a key role in athletic performance, and my early interest in the field came from my experience as an athlete. But over the course of my research, I also became interested in how heat therapy can improve the health of non-athletes. For example, in my dissertation work, we found that passive heat exposure, like saunas and hot tubs, can decrease both blood pressure and glucose response in women at risk for cardiovascular disease and diabetes. I’m driven by curiosity, but also by finding meaning in the work that I do and how it can help improve people’s lives. How has your first year at Salem State gone so far? Has anything surprised you about academic life or about our students? It’s been really exciting and challenging. I’m so impressed at how much my students juggle and at the same time how dedicated they still are to their classwork. I was able to continue doing research at Salem State, and I now have two undergraduates in the SMS research track working on projects with me. Working with them has been the highlight of my first year. What makes the Boston Marathon so significant to the running community around the world? The history of the race plays a big part – it’s the oldest continuous marathon in the world. Another element is the qualifying standards – qualifying to run Boston is not easy, and for many runners it’s the height of their career. Boston is also such a complicated puzzle. The course is really unique in that it’s a net downhill, but the placement of the hills makes running it strategically so important. The majority of runners are from the Northeast, so when it’s been really hot on marathon day, they may not be acclimated to it. Weather always ends up being a big part of the marathon story, from the hot years, to the tailwind years, to years like 2018 with the extreme wind and rain. There are factors in your control, like your training and your nutrition plan. But then there’s so much that is outside of your control, like the competition, the wind speed and direction, and the temperature. Those factors make it challenging, but also make it exciting when you get it right. What’s a common mistake that new marathoners make? Trying to do everything perfectly the week before the race. Making changes to your diet or your routine to try and get some benefit at the last minute is likely to make you feel off on race day. Trust your training and know that this isn’t the time to experiment, even with things that have worked for other people. If you’ve kept a training log, go over it and feel proud of everything you’ve accomplished so far. Some of my best races have been when I arrive at the starting line already feeling so proud of the work that I’ve put in. The race is the celebration of your work, not the proof that it was worth it. If readers are inspired by the marathon and the arrival of spring to lace up for the first time or after a long layoff, what advice do you have for them? Watch the race and get inspired! It’s hard not to get excited about Boston. If you’re a new runner, start small. You’ll still get the collaborative atmosphere, sense of accomplishment, and the finish party at shorter-distance races. Remember that you don’t have to be a marathoner to be an accomplished runner. Think about building gradually, running on nonconsecutive days and taking walk breaks if needed. Set goals but honor your body.